I know what you are thinking. This post is going to be about where I am staying. Slightly. The brick condo unit in the photo above was built in 1950. This is where I am staying with my sister. She has lived here for thirty-three years. Her length of stay is a testament to the design of both the condo and the grounds. I have always loved coming to this elegantly appointed and comfortable flat. That I notice the condo's architectural features fits into a long-time passion of mine. In the 1980's I became an active birder spending weekends out identifying birds. I eventually realized that I really had two hobbies: birding and “housing”. I haven’t been able to locate a word that describes an amateur who notices houses, identifies their style and examines their details. “Housing” is a word that seems to work. This of course makes me a “houser”. Birding and housing are complimentary. No matter where one travels there are birds and/or houses. The photo of the house on the top right is one that I spotted in Colorado Springs. The family who live here would likely love to have my paper dollhouse seen in the photo on the bottom. The dollhouse comes with a complete set of paper furniture. The two houses are fairly similar in style. Although I too had a dollhouse as a child (a metal one), my passion for housing went well beyond the toy version. As my family drove around town, I would be scanning rooflines, noting window or door designs and checking color combinations. Think about this. Adults ask children questions associated with reading, math or spelling. But adults rarely ask a child what they notice about a particular house or to pick their favorite house on a block. No one ever asked me questions like these. I think that I assumed that every child scrutinized houses like I did. I have taught preschool for years in a Reggio-inspired program. One year I became aware that a couple of kids were drawing house details unusual for their age. When I began making inquires I realized that there was a group of kids who could describe their favorite house... "My aunt's in another city", "the house with the stone turret", and "my uncle's castle" (which really existed). I was delighted to find fellow housers! Housing around in Colorado Springs is a joy. The chilly winds have inspired a particular porch design seen all across Colorado. I have noted them for years. Here are a couple of examples of porches that are only partially enclosed in glass. Chinook winds can be wicked. Welcoming even with the spooky Halloween spider webs! I have a hard time not thinking that I should buy a house here just because of the enclosed porches. As soon as I see one I think of curling up with a good book. One could host a passel of children of this porch! And serve them milk from the delivery box. This porch would have sun morning and evening. Good orientation for a sunlit breakfast and an afternoon nap. 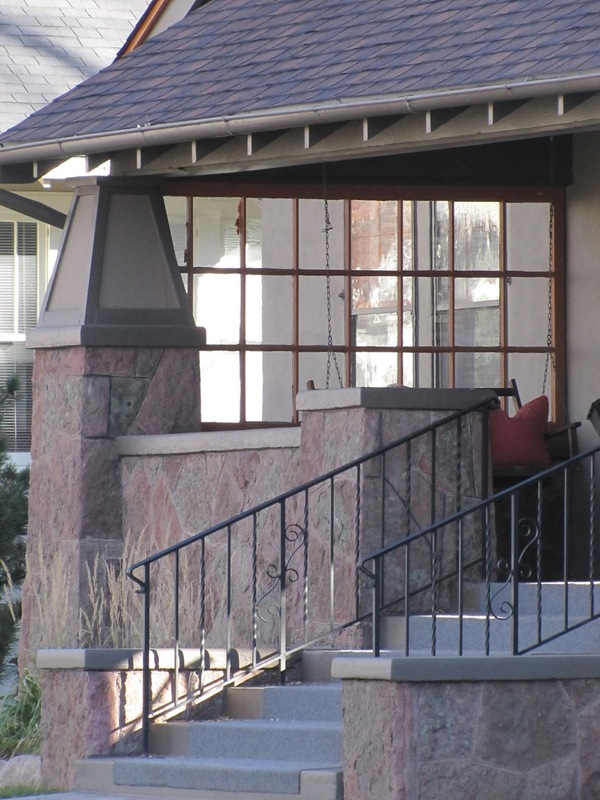 Stucco houses have their own version of places to sit and ponder life. Most blocks in the older section of Colorado Springs have at least one stucco house. I loved this house with its second-story ramada nestled next to that narrow extension. Surely the extension holds a bathtub. Housers, by the way, are always examining rooflines to find those vent pipes indicating kitchens or bathrooms. Actually tree houses for adults are becoming more common. Here is a link to a tree house accommodation in Sweden: http://www.dezeen.com/2011/01/12/tree-hotel-by-tham-videgard-arkitekter/ I mostly am showing you old houses in this post, but I love modern ones with equal interest. And what child can resist a turret room? Well what adult can resist one? Fairy tales, knights, heroic deeds are associated with towers and turrets. Turrets were originally added to buildings as defensive mechanisms for protecting walls. 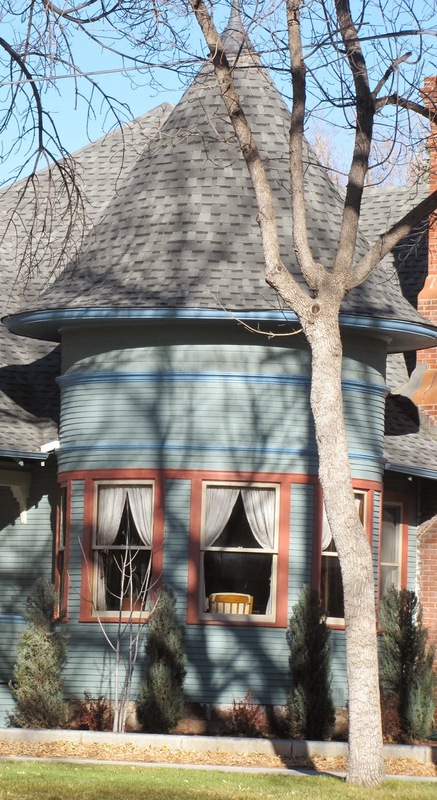 Today houses with turrets are frequently located on corners giving them the long view down their streets to either side, ideal for spotting approaching neighbors and watching children. Both of these houses are on corners. The house has double brick walls in both inside and outside walls with two-inch steel rods running up the middle of them. The rods reach from the concrete in the basement to the roof. At the time it was constructed a train engine had been blown off of a nearby track. Mr. McAllister was taking no chances as he made plans to build his home. The construction techniques were impressive for it's time. Today the plus of its design is that traffic noise is almost non-existent inside. I highly recommend house tours. A good docent can make the historical context of the house and it's period make sense. When this house was built it was the only one in the midst of shacks and tepees. When Mrs. McAllister would make pies from her fruit trees, the Indians would slip the pies off of the kitchen window ledge and leave her gifts like dolls for the children. This thoughtful exchange of goods is the kind of story often left out of history books. 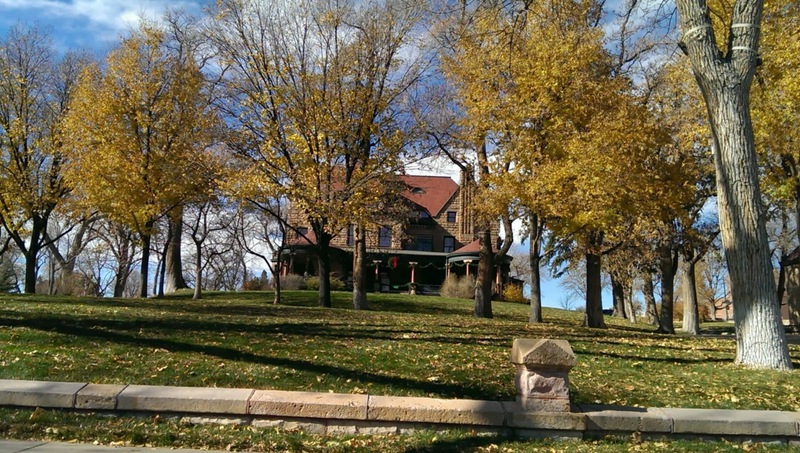 The second house that we visited was the Rosemont Mansion in Pueblo, Colorado. Thirty-seven rooms worth of a mansion is sitting on a full city block. I couldn't take any pictures of the inside, but the last surviving son donated the house with the stipulation that all of the rooms be left exactly appointed as the family left them. Interestingly enough the servant's rooms located on the third floor were quite nice, but the servant's place in society was subtlety noted by the doorknobs. On one side of a door there might be a really elegant doorknob. However if the room on the other side of this door had a very plain doorknob, this would be a room used solely by servants. If you were a guest and entered a room in error, you would know immediately by the doorknob that you were in say in the servant's dining room instead of the guest's breakfast room. House museums are often elegant. We are lucky that they are preserved. They help us appreciate fine architectural work. Henry Hudson Holly was the architect for this house. His use of the local red stone was exceptional. As National Homeless Month is celebrated in November, it would be negligent of me not to mention a houser's thoughts on the lack of houses for those among us struggling with the crippling effect of a political and societal failure to provide homes for every individual. The 1980's was an era when funding for subsidized houses was slashed by more than 50% with more cuts to follow over the years. We still see the effect of those decisions. Homeless wander our streets. I am encouraged to see many young architects focusing on alternative houses made with inexpensive materials. 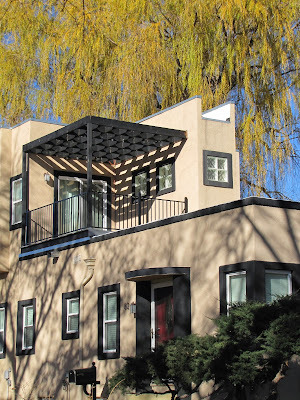 Even more encouraging is seeing such houses designed with precisely the kind of elements that make fancy houses homelike... porches, insulation, light-filled rooms and turrets. We have a long way to go to house our homeless. Ponder how you can make a difference. Little house perfect for some homeless soul. Thought of you today and yesterday traveling to Taos, Georgia O'Keefe's home at Abiqui and today Santa Fe. Will post a few photos of stucco details. Ever been in this area?